The allure to visit the graves of your ancestors is an innate part of what makes you a human being. Discovering how to find a person’s grave can seem like a daunting task. Because family trees can become complicated or lost, it may be difficult for you to locate the grave for each and every one of your loved ones. However, there are resources available to help you find a person’s grave. You can start by sleuthing your family tree. There are websites like Ancestry.com that will make the process much easier for you, but it will cost you a fee. You can find full names and birthdates on family bibles or baptismal and census records. Ask the members of your family if they have any old family documents. Sometimes, the abbreviations can be difficult to decipher. This list of genealogy abbreviations can help. The date and location of death can be found in local newspaper obituary archives. Most archives have been converted into digital files and can be easily found through the newspapers’ websites. If you’re really lucky, you will already have the birth and death certificates of the loved one in question and can set off to find the grave without needing to seek out other documentation. Contact funeral homes that were in business during the time of death and see if they have any records of your ancestor: In most cases, you will be told which cemetery to search. Go online to a burial website dedicated to locating gravestones: BillionGraves.com and FindAGrave.com are the two leading sites for this purpose. Volunteers take photos of gravestones and regularly upload them to both of these sites. Simply enter the vital information and the site will tell you where a person is located and will usually include a photo of the gravestone. Once you’ve established whether the person was cremated or buried and which cemetery contains the grave, take the time to look up the cemetery’s website. Most modern cemeteries have websites with maps making relatives and family plots easy to find. If the cemetery is small and has no website, you will need to contact the caretaker or administrator and ask them for the location of the grave. Keep in mind, no two cemeteries are the same. Because plots are purchased and families are often buried together, you will find that there is no logical pattern to where grave sites are located. 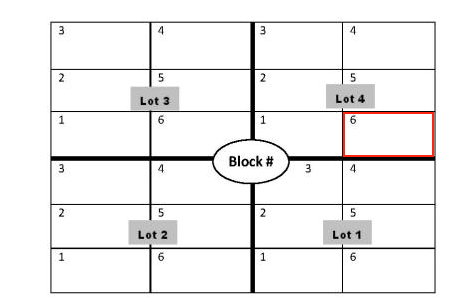 The red area indicates that a grave would be located in block 1, lot 4, section 6 of the cemetery. After you have found the resting place of your lost relative, you may choose to lightly clean the headstone with a dry brush, trim grass, plant flowers, do charcoal rubbings, take photos, or just visit on Memorial Day. Do not use cleaning agents on gravestones because headstones are porous and can be easily damaged by chemicals. Check here to learn more about genealogy.